Switzerland is a varied patchwork of languages and cultures. Divorce rates are no different varying by as much as 27.1% depending on the canton. Across Switzerland the rate was 41.5% in 2016, far higher than 32 years earlier in 1984 when it was 28.9% – a percentage increase of 44%. An average marriage in Switzerland these days lasts around 15 years. The canton with the lowest rate in 2016 was Uri with 22%. The highest was Vaud with a rate of 49.1%. 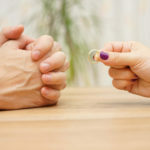 The five most divorce prone cantons: Vaud (49.1), Neuchâtel (47.4), Fribourg (47.0), Geneva (46.3) and Jura (45.8) are all French-speaking and have significant populations of people declaring no religious affiliation. Rises over the last 32 years were steep in most of these cantons too – see chart. To find Switzerland’s lowest rates of divorce requires a trip across the rösti graben to German-speaking Switzerland. Uri (22.0%), Appenzell Innerrhoden (22.1%), Nidwalden (27.9%), Appenzell Ausserrhoden (22.1%) and Obwalden (34.1%) had the lowest rates in 2016. All of these cantons, with the exception of Appenzell Ausserrhoden, had strong Roman Catholic majorities. Cantons with the lowest increases in divorce since 1984 were all highly urban: Geneva (+0.5), Basel-City (+5.3) and Zurich (+5.8). Geneva (45.8%) and Zurich (33.5%) were ranked first and fifth in 1984. By 2016, Zurich’s rate had risen to 39.3%. On more optimistic note, recently published data for 2017 shows a decline in Switzerland’s overall divorce rate to 36.1%.